As anyone using the VLE will have noticed we’ve been working hard to make sure the VLE is both more usable (in terms of how it looks and works), as well as making the content work better on mobile phones and tablets. 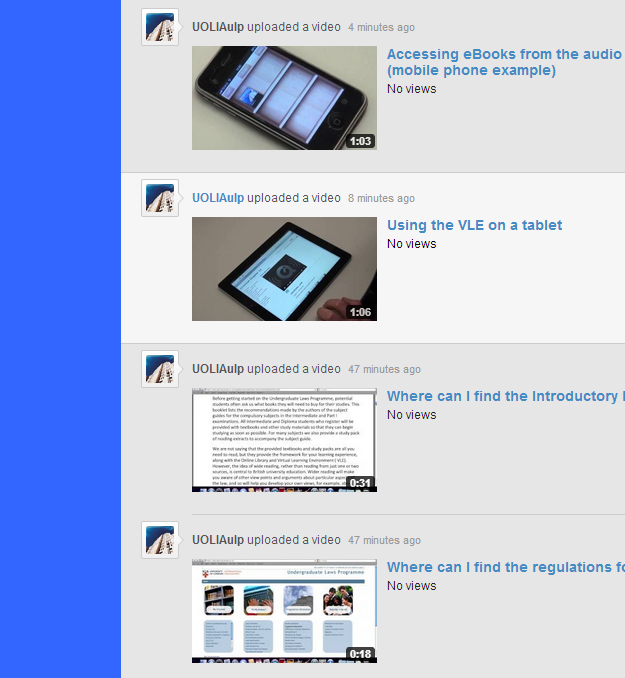 We appreciate that we have made a lot of changes to the VLE, and so we’ve made a series of helpful videos on how to best use it. You might find some of the videos show you features you didn’t know existed or things you didn’t know you could do. Why not give them a try! Each video is only a minute or so long so you can watch them whenever you have a little free time. We’ve taken the step to add the videos to Youtube so they will be easy to access, and you can also follow us when we add new materials. Our Youtube channel is http://www.youtube.com/user/UOLIAulp. Next Post: Bangladesh Convocation – book now!